Equifax’s average 36 percent approval slightly outpaces its peers in the financial services industry. The financial services industry as a whole has a 29 percent favorability rating. 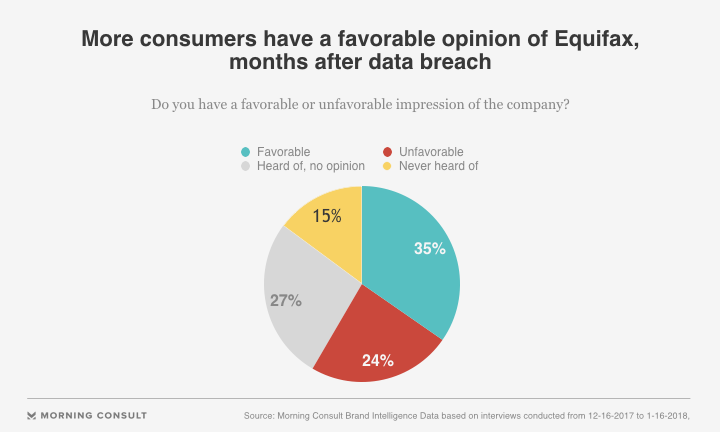 Nearly five months after Equifax Inc. announced a huge data breach that compromised the private information of more than a hundred million U.S. consumers, the credit reporting agency’s public favorability is mostly holding steady at 35 percent, according to Morning Consult Brand Intelligence data. The credit bureau boasts a seven-day moving average net favorability rating of 14 percent, according to Morning Consult data. The firm’s unfavorability rating is 22 percent as of Jan. 16. Twenty-four percent of surveyed adults responded that their impression is somewhat favorable, while 12 percent have a very favorable view of the credit bureau. Equifax’s average favorability rating of 36 percent slightly outpaces its peers in the financial services industry, which combined have an average favorability of 29 percent. All of this comes after a scorching round of Capitol Hill hearings in October. Lawmakers, led by Sen. Elizabeth Warren (D-Mass. ), grilled the company’s former chief executive, Richard Smith, over the data breach in which the personal information — including Social Security numbers — of as many as 145.5 million U.S. consumers was compromised. As far as brand approval goes, the credit bureau is in a similar position to Wells Fargo & Co., whose September 2016 cross-selling scandal led to a dip in favorability that bottomed at 29 percent. Five months later, the bank’s favorability had recovered slightly to 38 percent on Jan. 15, 2017, which eclipsed the then-27-percent average favorability of the banking industry. Wells Fargo and Equifax have different goals, however. While Wells Fargo is a major retail bank that relies heavily on customer receipts, Equifax’s business model is less focused on dealing with consumers since it provides services for lenders. John Ulzheimer, a former credit bureau employee who now monitors the industry, said that despite initial critical reactions to the data breach, consumers may have changed their outlook on Equifax. “I think everyone was outraged initially, but then the question was: What are you going to do about it?” Ulzheimer said in a Jan. 12 phone interview. Ulzheimer noted that litigation related to the data breach will likely continue to plague Equifax in the coming years, but that the “garden variety consumer doesn’t really follow” those issues. Companies that work with credit reporting bureaus are unlikely to alter their relationships with the firms if customers aren’t clamoring for a change, he added. Customers “really don’t know that there may be the word ‘Equifax’ involved with the process” of applying for a loan or mortgage, he said. “Generally, when a bank would do something is when their customers influence them to do something,” he said. Bartlett Naylor, a critic of the financial services sector who works as a financial policy advocate for Public Citizen, noted that consumers probably view the Equifax scandal differently than Wells Fargo’s. Representatives for both Wells Fargo and Equifax did not immediately respond to requests for comment. Correction: A previous version of this story misstated the number of U.S. consumers affected by the Equifax data breach.